Adventures and observations of a biologist and watercolor painter in Arizona's deserts and mountains by Margarethe Brummermann Ph.D. The short, sunny winter day in the desert ends with beautiful warm lights and deep shadows. It's easy for our dogs to make us go for a sunset walk. Above is the view south across our property with Wassem Peak and Saguaro National Park West in the background. Looking north, through State Trust Land with many Saguaros and even more Chollas into the flat spread of Avra Valley. On our fence waits a little fly catcher that I haven't seen here before. Maybe a Wood Peewee? Wild guess. Too bad that with two impatient dogs in one hand and the camera in the other, and very little light, the focus is off. Ants are still active, but dragging their tarsi. Veromessor pergandei, harvesting the seeds of those November-blooming Chinch Weeds I think. Frodo heard the song of his Coyote relatives and took off to find them. But he eventually returned tired and panting while the choir kept serenading us. Or maybe they were just inspired by some sirens on the freeway. One of our Great Horned Owls took off from a branch right above my head ans landed not too far from us, not afraid of humans or dogs. The light was now really getting bad. Using the little built-in flash also turned out less than ideal .. Too bad, because the guy was endlessly patient. The sky was now getting dramatic - and Saguaro silhouettes do set it off perfectly. The best colors over Kitt Peak and Ragged Top in the Northwest across Ironwood National Monument. It's nice to live right in the middle of two great parks!. Happy Winter Solstice to all on the northern half of the world! Evolution has produced many outrageously colorful arthopods. The driving factor may have been communication, intraspecific to attract partners or interspecific to warn or deceive predators. Many patterns and color combinations that appear out-standing when seen out of context may be very cryptic on the right, natural background. Pigments also protect underlying tissues from radiation damage and play a role in thermoregulation. Transparent epithelia that allow hemolymph or inner organs be visible and therefore to determine the outer appearance. The abdomen of a mosquito is red shortly after a blood meal, and some spiders adopt the color of their prey if they feed on highly pigmented insects. They 'become what they eat', for a short time. 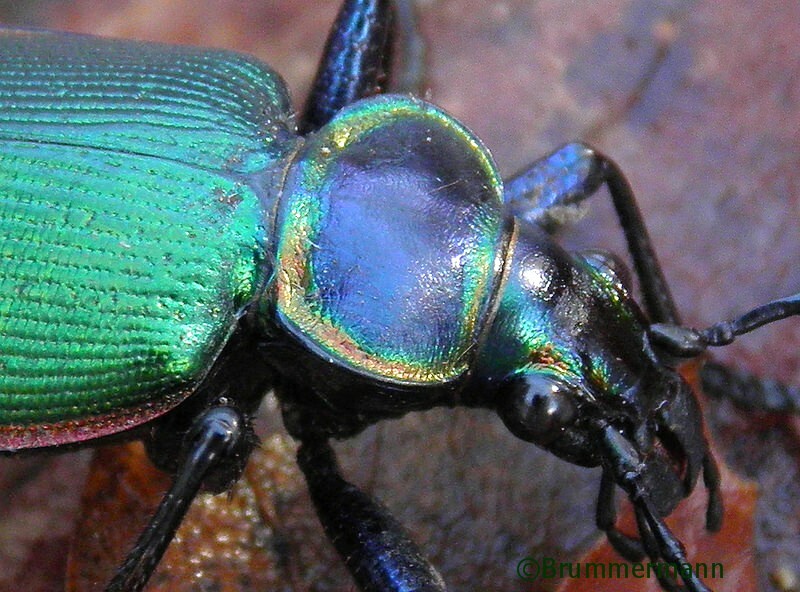 Many colors of arthropods are based on organic pigments that are embedded into the exoskeleton or cell layers directly underneath it. These pigmental colors are based on the partial absorption of light. The pigments (carotenoids, ommochroms, flavenoids, quinones, etc) are obtained from food and sequestered or products of the insect's metabolism, often by- or waste-products, and their stability is based on the animal's living, active metabolism. 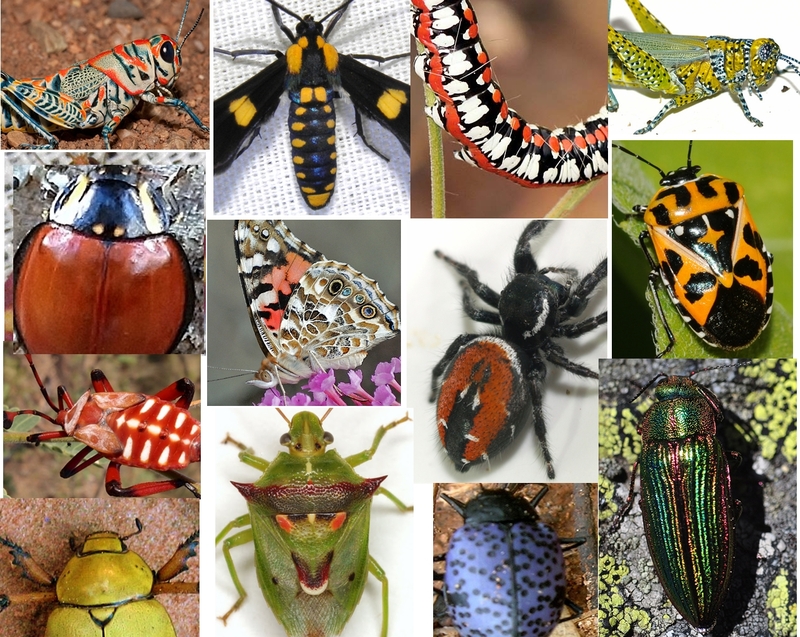 Some arthropods have the ability to change these colors actively (Crab Spiders, Tortoise Beetles). Pigment based colors typically change or fade after death. Structural colors are either based on the selective refraction of reflected light by the exoskeleton or by living cell layers directly under a transparent cuticle. I cannot find definite explanations of the mechanism, but these refracting elements in the latter seem to consist of layers of lipid droplets. 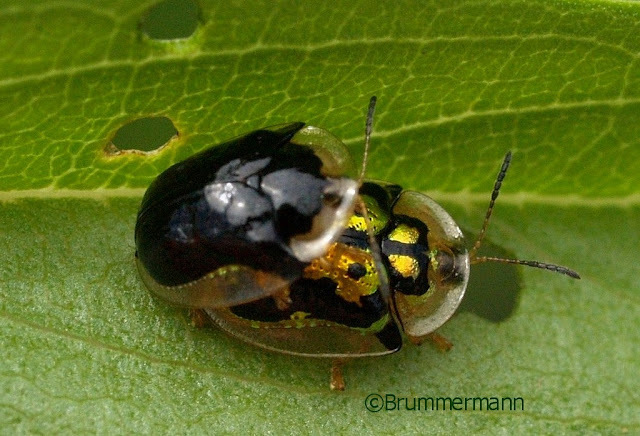 Many tortoise beetles are able to control these refractors, effectively switching from a bright gold metallic to a dull brown or red appearance. The permanently metallic appearance of many other insects is created by the unique structural arrangements of many dozens of layers of exo-skeletal chitin. The cuticle, which is just 10 millionths of a meter deep, has some 70 separate layers of chitin—a nitrogen-containing complex sugar that creates the hard outer skeleton. All these layers have different refractive indices. Incoming white light (sun light) is refracted through—and reflected by—each interface giving, in particular, phase differences in the emerging reflected rays. For several wavelengths in the visible range, there are many reflected rays whose phase differences allow for constructive interference. This leads to the metallic appearance of the the insects. The resulting colors are called 'structural' as opposed to 'pigmentary'. These structural colors outlast the death of the insect. (Loosely quoted from "Visible light reflection spectra from cuticle layered materials," by Cristian Campos-Fernández, Daniel E. Azofeifa, Marcela Hernández-Jiménez, Adams Ruiz-Ruiz and William E. Vargas Optical Materials Express). 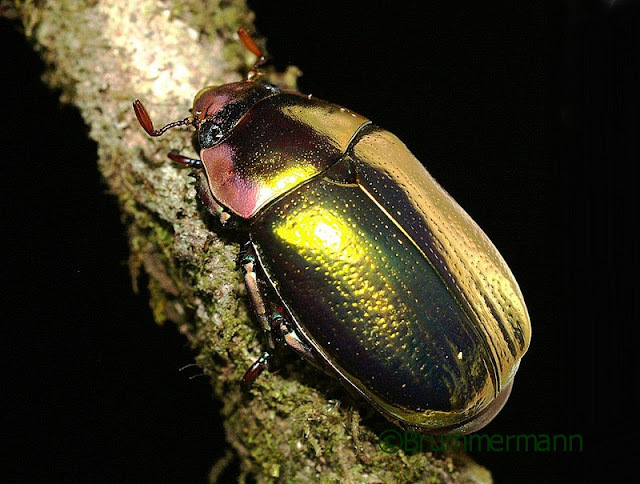 The cited study was concerned with Costa Rican Scarabs that appear golden all over. Very shiny beetles like those may blend in with the multitude of dew or rain drops sparkling on the foliage around them, especially in the dim light of the tropical rain forest. Metallic patterns on parts of larger bodies may also break up the larger shape and hide it that way. 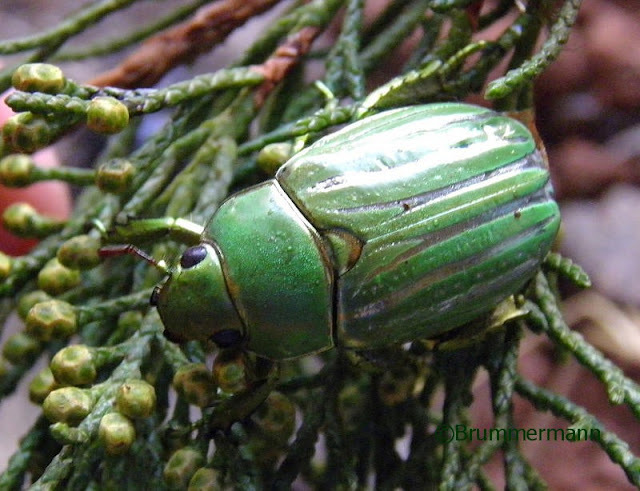 I have noticed this for example in beetles and caterpillars that live in the lacy foliage of mesquite or juniper. Seen from below, against the light, these insects are less visible than their non-reflecting relatives. Does the metallic appearance of the exoskeleton indeed indicate a certain hardness and armament of the wearer? 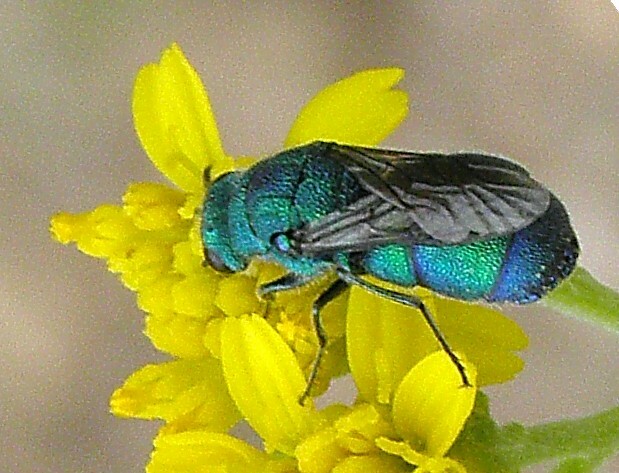 Several parasitic bees that seem to get into scuffles with their host species appear particularly metallic. Not to forget: The colors of butterfly wings are also structural, even if they do not usually appear metallic due to the small size of the colorful sub-units, the scales. In some species, however, the arrangement of the scales is such that iridescence is achieved. At the U of A, studies are under way, looking into the importance of these direction dependent flashes of color in the partner choices of our Pipevine Swallowtail. Please also visit Margarethe Brummermann Watercolors, my new blog that show-cases my art, from watercolors to insect photography collages. In that blog, I will introduce new pieces, announce upcoming shows and other events, and provide links to archived images and my contact information. I am a biologist, watercolor painter, and photographer originally from Dortmund, Germany. In 1995 I founded my business, Brummermann's Art and Sciences in Tucson, Arizona. Through this venue I am selling my original watercolors and insect collages, offer services like high quality art printing (giclee) art classes. I offer naturalists' presentations on many topics, I prepare and design and graphics for scientific publications. You can license my photographs. 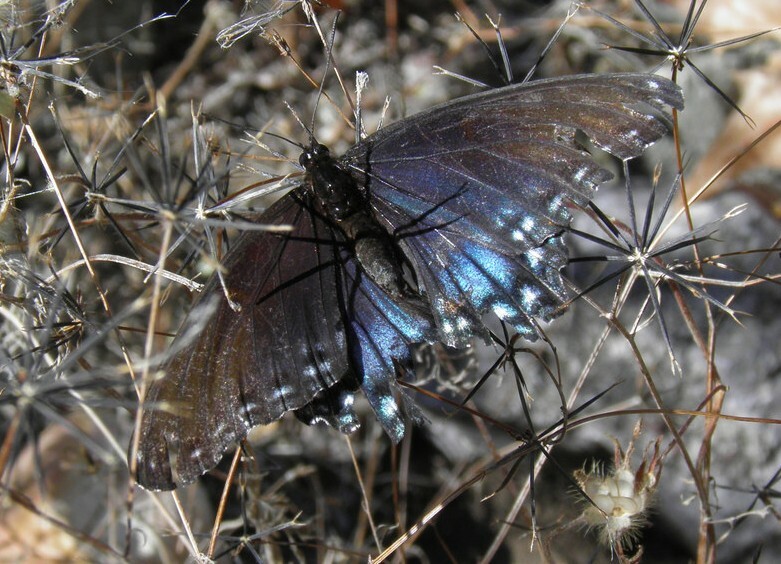 I collect Arizona insect specimens upon requests for scientists and researchers. I offer guided, very personalized tours to exciting natural areas in Arizona. I am producing a photographic field guide to Arizona beetles with co author Arthur Evans. For this purpose I have collected, identified and photographed (life) over 1800 Arizona Beetle species. I am still searching for additional under-writers to help finance this project and will start a crowd funding campaign soon. © Margarethe Brummermann and Arizona: Beetles, Bugs, Birds and more (ABBB), 2009/2012. Unauthorized use and/or duplication of this material without express permission from this blog’s author and owner is strictly prohibited. Excerpts and links may be used, provided that full and clear credit is given to Margarethe Brummermann and ‘ABBB', with appropriate and specific direction to the original content.